That’s a rhetorical question because you can never have too many architects helping out at their local food bank. TLCD Architecture had a team volunteer at the Redwood Empire Food Bank (REFB) last Friday and it was both gratifying and a great team building exercise. A staff member gave us a tour before we settled in to pack food. Within 90 minutes we had packaged and loaded nearly 5 palettes of food boxes. Anyone remember the “I Love Lucy” episode where the assembly line items are flying by? It felt that way at first, but we got the hang of it! We heard that the facility needs 1200 volunteers each month to get food processed and packaged, so we will definitely be back. The votes are in and once again TLCD Architecture has been voted a Best Places to Work by our team! The annual North Bay Business Journal survey highlights local firms that have great workplaces. TLCD has no shortage of good times, professional fulfillment and camaraderie to share. This is a team that enjoys working collaboratively during office hours, as well as playing well together after hours. This blog was launched 5 years ago with a goal to talk about our company culture, feature interesting updates on our projects and engage in a conversation about the practice of architecture. 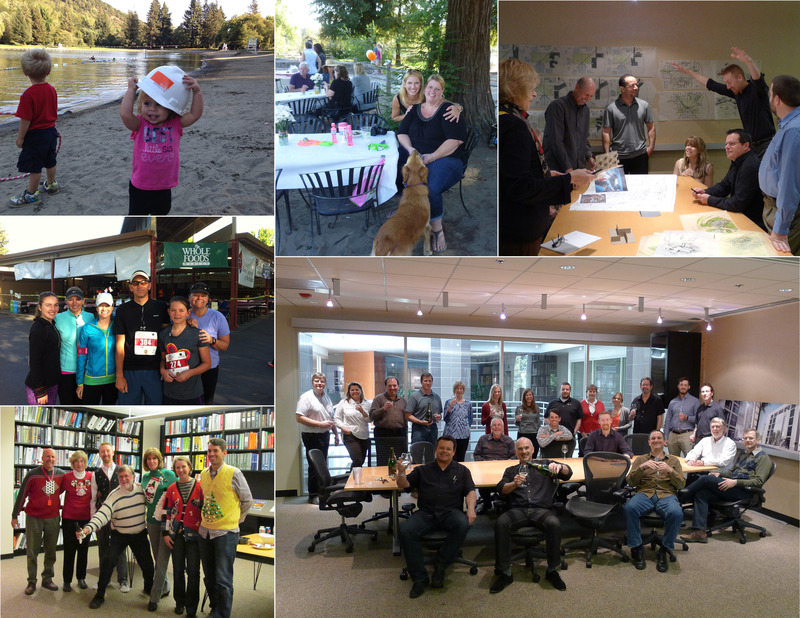 We hope it shows the world a little about ourselves and what makes TLCD a great place to work! 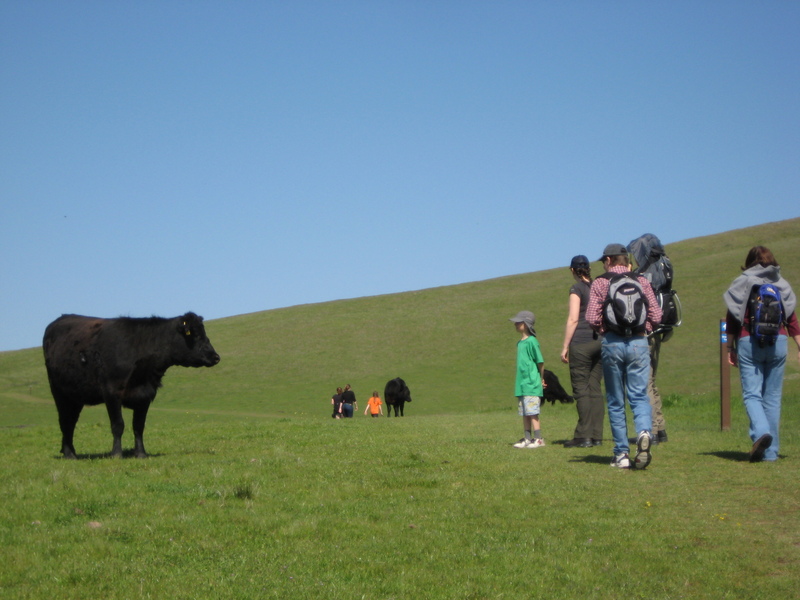 Architecture has formed two teams of 9 for the Live Healthy Sonoma County 10 Week Wellness Challenge… team New Dimension and The Flying Buttresses! As a Gold member of the Sonoma County iWORK Well program, TLCD has had a workplace wellness program called the Fit Force in place for 5 years. This Wellness Challenge comes at the perfect time of year when the colder winter weather (in theory) drives us all indoors. The two teams will focus on exercise, healthy eating habits and team building using the Live Healthy website to track results. The end result will be a wonderfully fit staff…many of whom will be participating in the Human Race that follows in early May. Follow us as we share stories and photos of our Wellness Challenge! 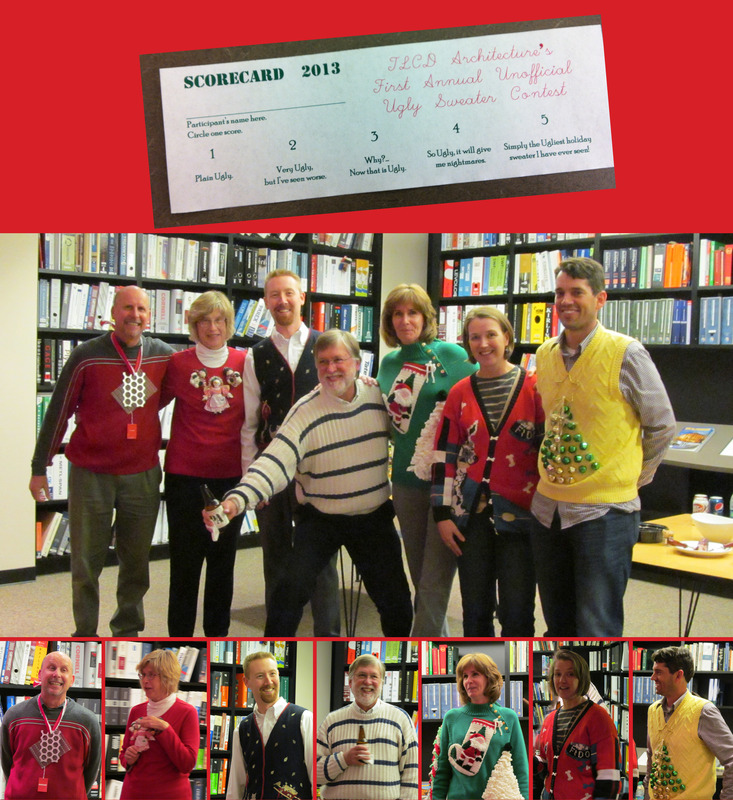 This week’s Wine Wednesday had the staff participating in “TLCD’s First Annual Unofficial Ugly Sweater Contest”. Those braver folks hung in wearing their sweaters all day long… and one architect in particular could be heard from the other end of the office as he approached in his “jingle sweater”! It was great fun and hopefully inspired others to start planning their ugliest sweaters for next year… and the coveted Ugly Sweater medallion. 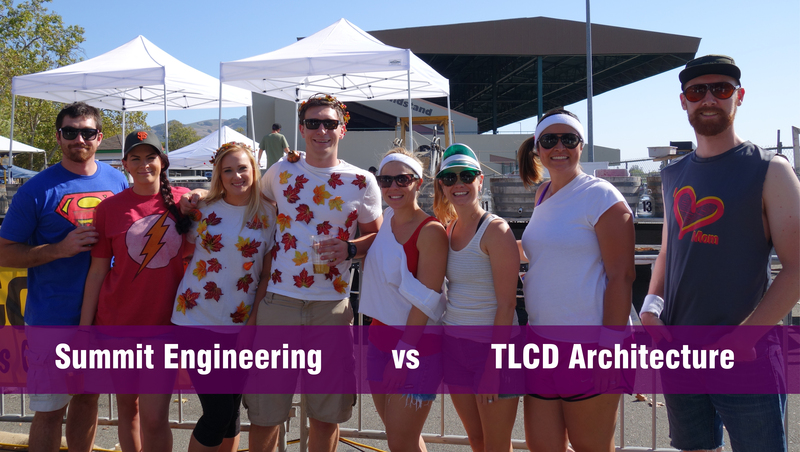 For the 4th consecutive year, TLCD Architecture has participated in the fun of Sonoma County’s Human Race as a Water Station sponsor. This is highly technical work and requires the expertise of only the best Hydrating Engineers. From pouring water into small cups, to carefully balancing them on the end of fingertips, the technique must successfully deliver water to quickly moving objects… aka runners and the slower moving walkers! Bill McNearney, Alan Butler, Marina Starkey, Don Tomasi, his son Jeffrey were all on hand to demonstrate their technique and to cheer everyone towards the finish line of the 10k race. TLCD also had several participants in the race including Gwin Stumbaugh, John Dybczak, Sandy Petersen and her family. This is an event TLCD looks forward to each year and a great chance to give back to the community.